Southampton vs. Chelsea : 1 January 2014. Outside, the rain lashed against the van windows in irregular gusts. The damp winter air was shrouded in a deadening blanket of dense cloud. There were many puddles of dirty grey rain water alongside roadside kerbs and pavements. The streets around Southampton Central train station were virtually deserted. The station car park was practically empty too. The New Year was only eleven hours old and the game was still four hours away, but here we were; ready for the first Chelsea match of 2014. While it may be true that only mad dogs and Englishmen go out in the midday sun, one wonders if anybody or anything accompanies Chelsea fans in a late morning downpour in the middle of winter. Glenn had collected me at 9am and Parky had been picked-up from an equally deserted Warminster station at 9.30am. 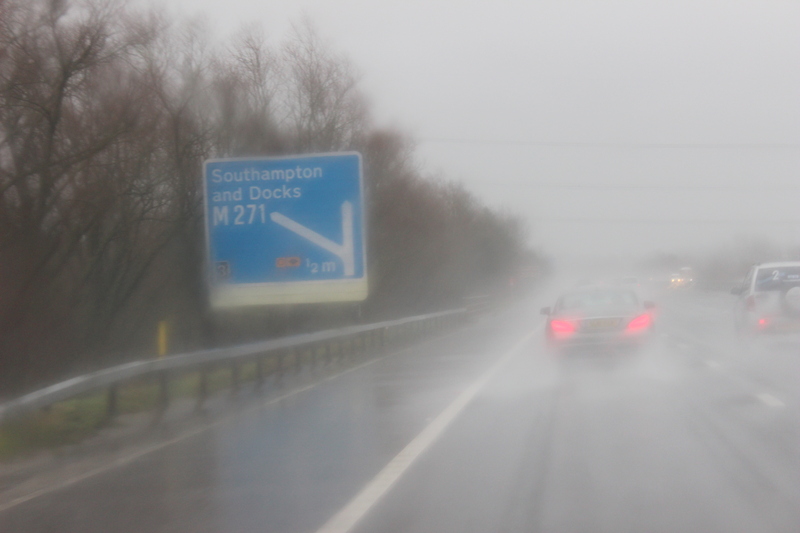 The A36, a main trunk road which links Bath with Southampton, was almost devoid of vehicles. For once, there was no traffic jam in the city of Salisbury. However, it was 10am on New Year’s Day; what other idiots would be out and about at that time? Chelsea fans, ducks, mad dogs and mad ducks. The first pub – “The Encore” – was closed until midday. The brisk walk from the station took us close to the city’s large civic centre, where I once saw Everything But The Girl in 1999, and which has a rather stunning white stone Italianate clock tower. It reminded me of a few of Mussolini’s brutal civic buildings in Italy. We soon found a cosy corner upstairs and settled ourselves for three hours of drinking and community singing. Outside, looking through steamed-up windows, pedestrians were rare. The rain continued to fall. It seemed that every person baring the elements was headed for “Yates’s” too. The central area of Southampton was badly bombed by the Luftwaffe during World War Two; the result is a strange mix of open green space where buildings originally stood and a charmless shopping centre. The pub soon filled with match-goers. Chelsea fans were in the majority. There were a few familiar faces from near and far. Very soon, the music began pumping out some songs much loved by the football-loving clientele. The Jam, The Clash, Madness, you can guess the rest. With Glenn driving, this was a chance – at last! – for me to unwind and enjoy a few game day liveners. Soon, the Chelsea fans downstairs were singing along to “It Must Be Love” by Madness. Half as much as I do. And I never thought I’d feel this way. In the adjacent booth, five foreign student types – presumably unused to an English match day vibe – were giggling to themselves at the sound of two hundred Chelsea fans singing about love, love, love. Next up, “The Liquidator” and the whole pub was up. Then, later, K.C. and the Sunshine Band got an airing. Then “Three Little Birds.” I remember the Chelsea faithful singing that particular song – and meaning it – just down the road at an equally rain-soaked Fratton Park in 2010 when our league campaign took a sudden jolt with a fantastic 5-0 win. Good times then, good times now. 2014 was off to a good start. I was loving every minute of it. At 2.15pm, we set off for the stadium, past the park, through the subway, past some down-at-heel shops. Thankfully, the rain wasn’t quite so strong on the fifteen minute walk to St. Mary’s. We were soon inside. The youngsters serving pies and pints were wearing special blue Chelsea t-shirts; a nice touch, I thought. The area beneath the away stand at St. Mary’s is a particularly dark and dismal place, but the Chelsea fans weren’t worried. The songs were coming thick and fast. Inside the bowl of the stadium, the floodlights were on, the spectators were assembled and I giddily made my way to join up with Alan and Gary right behind the goal. It looked like virtually every seat was sold for this one. Chelsea were in good voice as the teams entered the pitch. Hopefully the game would follow our 5-1 F.A. Cup win last season – almost a complete year ago – rather than the lame 2-1 defeat in the league a few months after. The rain was still falling. Despite being under the cover of the roof, we experienced the occasional splash of windswept rain. I pitied the poor fellows in the first few rows. At the same stadium in 2002, in similar circumstances, I was one of the unfortunates getting drenched down the front. I quickly glanced at our starting eleven; with a few forced changes, we knew there would be a different selection from against Liverpool. Notably, in came Juan Mata, Andre Schurrle and Fernando Torres. We began very brightly, with Fernando Torres the immediate star, dribbling his way into the Southampton penalty area on a number of occasions. Shots from Schurrle and Ramires, after a fine dribble from deep, suggested that the songs emanating from the Northam Stand would soon be replaced by cheers. However, I couldn’t help but notice that our play seemed to be mainly down our left flank. Very often Juan Mata, in acres of space out on the right, was not picked out. I felt his frustration. Slowly, our dominance seemed to fade as Southampton, strangely minus Ricky Lambert, grew more dominant. A succession of timely interceptions and brave blocks kept Southampton at bay. On the terraces, there were plenty of songs. At the break, I squeezed in another pint. With us now attacking the three thousand predominantly neutrally-dressed away followers – I’ve never seen so few wearing Chelsea colours, Gourlay must hate us – we hoped for greater things in the second-period. Soon into the half, the manager made changes, replacing Schurrle and Mata with Willian and Oscar. The away end was soon up in arms. Well, we were incandescent with rage when – instead – Oscar was shown a yellow for a dive. Soon, however, the texts came in to say that the little midfielder had indeed dived. I was just filled with disbelief. Surely…just try to bloody score? On the hour, the same player jinked and weaved in from the left and his chipped effort was pushed onto the far post by a scrambling Davis. The ball bounced back into play and Torres was able to readjust quickly to head home. The Chelsea fans screamed delight. The supreme irony of no Chelsea striker scoring away in the league throughout 2013 and yet Nando taking just an hour into 2014 was not lost on me, nor the three thousand other away fans at Southampton nor the countless millions around the globe. Southampton brought on Lambert to replace former blue Jack Cork. The bustling centre-forward was soon involved, but Chelsea added to our lead on seventy minutes. Oscar enjoyed another lovely run, with gorgeous close control, to the edge of the “D” and then picked out Willian. A quick body swerve to throw the defender off balance and a fine low shot found its way inside the corner of Davis’ goal. More Chelsea pressure followed and Oscar capped a fine performance with another run into the Southampton box following a lofted ball into space from Eden Hazard. He struck quickly this time and the ball took a slight deflection before ending up in the Southampton net. With that, there was a mass exodus. With three points secure, there was just time for a cameo from Michael Essien and the chance for us to serenade him with his own personal song. “Give it up” for The Bison. The Mourinho magic – the substitutions, early in the second-half – were perfect. It’s unlikely that two substitutions will pay off so perfectly again for a while. Oscar and Willian added fresh drive to our team. They were simply superb. Christmas 2013 and New Year 2014 had been excellent. We had tasted victory on three occasions and had shared the spoils at a title contender’s home stadium. Ten points out of twelve. Not perfect, but bloody good enough. Sometimes, some moments are just there to be savoured. I think 2014 is going to be fine, just fine. Chelsea vs. Southampton : 1 December 2013. December was upon us and our first game in a very busy month involved the visit to SW6 of high-flying Southampton. The team from the south coast caused us huge problems during the two league games of the previous campaign, beating us 2-1 at St. Mary’s and earning a point in a 2-2 draw at Stamford Bridge. This would not be an easy game. After the very poor performance in Basel on Tuesday, another match could not come quickly enough. However, although the minds of most Chelsea supporters were centred on the game, my build-up was focussed elsewhere. This game would mark the return to the fold of a good friend – one of the Frome Gang of Seven, then Six, then Five, then Four. Paul – or PD – was back. I first met Paul, famously – or infamously – on the train on the return trip from a famous – or infamous – away game at Cardiff in March 1984. After we drew 3-3 after being 3-0 down with just six minutes remaining, a couple of the Frome brethren had been arrested and there was talk in the crowded train compartment of the afternoon’s events. There was talk of “Daniels” and I wondered who this was. My Chelsea journey was in its infancy; these older lads had obviously been going to games for a few more years than me. I was all ears. Paul appeared at the door to our compartment wearing old school boots and jeans, maybe a green flight jacket, with cropped hair and a fearsome reputation that went before him. Soon after his appearance, the compartment was singing “Daniels Is Our Leader.” I was predictably impressed. Later that season, I travelled up with him in a car with three others for the decisive game with Leeds United. Oh what a day that was. Since then, there have been numerous Chelsea games in his company. Sadly, in September 2010, Paul was involved in a horrific accident at work; he was working in one of the many tarmac gangs that have made my local town a veritable capital city for road resurfacing. There are many limestone quarries in the area – seen from the air, the local Somerset landscape is pot-marked by vast open areas of grey – and so, as a result, Frome is now home to hundreds of “Boys from the Black Stuff” who hurtle about the English countryside in teams, patching up roads and motorways with limestone. After the accident, Paul almost lost his leg and has not worked since. I have often bumped into him at the local football club, and he has often aired his yearnings to be able to return, one day, to Stamford Bridge. Sunday 1 December 2013 was that day. I collected PD at 9.30am and Lord Parky soon after. The Boys from the Blue Stuff were soon on our way east. There was a real sense of the Southampton fixture being a “must win” game for Chelsea to keep in touch with Arsenal. With a fixture at the Emirates looming large on the horizon, we needed to keep on their coat tails. And yet it got me thinking; surely this contravened my general, relaxed, thoughts about this being a transitional season where the league title might be beyond us. Was this game important to gain three points or to simply expunge the awful performance in Switzerland from our collective memory? Well, whatever it was, I guess it is human nature to want to win every game. The thought of losing to Southampton, not unfeasible in the current “will the real Chelsea please stand up?” climate, and therefore allowing Arsenal to remain seven points clear, made me anxious. In fact – and I am sure I am not alone – the thought of Arsenal winning the league, after their much-scorned period of drought, made me feel nauseous. In comparison, a league win for either of the two Manchester teams seemed to be the far more palatable option should Chelsea falter. This wasn’t an exact science though; if questioned, I am sure that I dislike United more than Arsenal. At 12.30pm I deposited PD and Parky in The Goose, where I knew that they were in for a warm welcome. I headed on to Stamford Bridge where, for the first time this season, I popped in to the megastore to buy a few Christmas presents. I was pleased to be able to collect the new, full game DVD of Munich. Ah, Munich. Just the name, just the name. By the time I had met up with the boys in the pub, Manchester United had dropped two welcome points at Tottenham. Soon after, the Hull City vs. Liverpool game was on the TV screens. We ignored the game and just chatted. My mate Foxy, who I had last met up with on a trip to Scotland a mere fortnight previously, soon appeared with his son Ricky. But the day was all about PD really; there were hugs a-plenty for him. It was great to see. By the time we had walked down to the stadium, Liverpool had conceded a third goal at the KC Stadium and things were looking up. With points being dropped by United and Liverpool, a Chelsea win would be a magnificent winter warmer on this cold December afternoon. PD took his seat next to Alan and me. This was another full house with hardly any empty seats. Southampton had around 1,500 and one paltry flag. I soon spotted Foxy and Ricky in the front row of The Shed. And there was Parky a few yards away. A quick scan of the team; surprisingly a start for Michael Essien, the “three amigos” of Hazard, Oscar and Mata were reunited, no place for Sir Frank and Fernando Torres recalled. Still no Luiz. Was Southampton’s goal by Jay Rodriguez the fastest-ever goal at Stamford Bridge in 108 years? Surely, there couldn’t have been many that were quicker. A terrible intervention by Michael Essien had spun the ball into the path of the Southampton striker, who slotted the ball past a stranded Petr Cech. The 1,500 away fans boiled over in jumping, leaping ecstasy. With the Stamford Bridge crowd stunned into an eerie silence, Chelsea encountered a horrible first-half malaise; was it a hangover from Basel, one of the most lack-lustre performances that I can ever remember? We played in a fog of self-doubt and faltering confidence, with little movement, and a dearth of crunching tackles in the midfield and penetration up front. There was, again, a distinct unwillingness by key players to take hold of the game by the horns. Too often players played the ball to a disadvantaged team mate, eschewing responsibility, rather than create with their own skills. Oscar was very quiet and Mata peripheral. Hazard showed willing, but there was little movement off him. A strong Torres run into the box at least showed willing and desire. However, Cech was largely untroubled despite Southampton’s persnickety persistence. We had no more than a few half-chances as the afternoon grew darker. It saddens me to report that Michael Essien endured his own personal nightmare. His unfortunate error in the build-up to the Southampton goal aside, his play was strewn with passing errors, poor tackles and – worst of all – he often found himself out-muscled as he tried to retain possession. I felt for him. The biggest ignominy of all? A silly dive – simulation as it is called these days – after he had lost possession. He was rightly booked. Two late chances in the first-half were the highlights of the entire first period. On forty minutes, Torres did ever so well to retain possession and battle off a defender and dig out a cross for Oscar but his header was right at Boruc. Soon after, there was a superb Boruc one-handed save from a Torres header. Oscar fell injured and was replaced by Frank Lampard; so much for a day off, eh? I’m also sad to report that there were – of course! – boos at half-time. It dawned on me that I have an increasing, festering dislike for many of my fellow fans. To my annoyance and consternation, I have almost given up trying to support the team during those times when The Bridge is silent. Even only five years ago, I would try to rally the troops around me, but what is the point? What is the bloody point? With every passing season, the atmosphere at home games decreases. How far have we fallen? Let me give a quick illustration. Way back in 1992, with Chelsea enjoying a little run of form under Ian Porterfield and in the top six of the table, we met Southampton at home on Boxing Day. In 1992-1993, I largely travelled to games alone and only met up with Alan by chance. I had just recently learned to drive the previous season and so was enjoying my new found freedom; it was, in fact, the first Boxing Day game I had ever seen at Stamford Bridge. I was well aware that there were plans to remodel Stamford Bridge and so I had decided to take my father’s rather large camcorder to the game and capture some of the day’s events on film, aware that The Bridge might soon be changing its appearance. I have rather grainy footage of the old Fulham Broadway station, early-morning risers walking past the old souvenir shops on their trudge to the forlorn entrance to the West Stand, all corrugated iron and ancient turnstiles. The main forecourt is captured, quiet, awaiting the day to unfold. I managed to smuggle the camcorder inside and capture several moments of the actual game. I was sitting halfway back in the East Stand. Our football that season was rudimentary stuff. We often played with Tony Cascarino and Mick Harford in the team. It was direct and far from pretty. However, most tellingly of all, the video film from almost twenty-one years ago shows repeated evidence of honest and heartfelt clapping, encouragement and applause at every single worthwhile Chelsea attack. The ball is played up for Graeme Stuart to run on to? Shouts of encouragement. The ball goes off for a throw-in near the Southampton goal-line? Widespread clapping and applause? A pleasing period of play involving Dennis Wise and Andy Townsend? More encouragement. The difference between 1992 and 2013 is galling. At half-time, I returned to my seat and spotted Neil Barnett on the pitch with an elderly gentleman in a gabardine coat. It was John Payton, apparently our oldest-ever former player at ninety years old. I can’t lie; it is not a name that I am familiar with. In a strong Scottish accent, he encouraged the crowd to get behind the players in the second-half and pleaded for us to make some noise. The response from the docile crowd annoyed him. I knew how he felt. No surprises – Demba Ba replaced the struggling Michael Essien. The crowd, thank heavens, seemed immediately more energised as we upped our play. A Frank Lampard free-kick was well saved by Boruc. On fifty-five minutes, a Juan Mata corner was aimed high and Brana leaped to force a header back in towards goal. Demba Ba lunged at the ball and it bounced up and off a post back into the six yard box. Gary Cahill, falling, did ever so well to contort and twist his body to head the ball in. The Bridge roared. Back level. Gary raced away and milked the applause down below me. There was noise – proper noise – at last. Boruc injured his hand and was replaced by Gazzaniga. Six minutes later, Juan Mata played a ball into the box. With the camera to my eye, I saw a body rise and loop a header up and over the substitute ‘keeper. I clicked just as the ball was on its rise. The ball nestled in the goal. There was a loud yelp and a jump from myself. I let out a guttural scream. I soon focussed on the player racing towards me and obviously realised that the scorer was JT. Until that point, it was all a mad blur. This was a very typical John Terry goal and it reminded me instantly of two similar goals at the same end, versus Barcelona in 2005 and versus Manchester United in 2009. The emotion on our captain’s face was a picture. I photographed the scream, the shout, the slide. Captain. Leader. Legs First Slider. This was more like it, Chelsea. Southampton were tiring now and were soon chasing shadows as two sublime slide-rule passes from first Ivanovic and then Mata were played in, dissecting the Southampton defence. Demba Ba added an extra dimension to our play and his strong run on seventy-one minutes was almost rewarded in a goal, but his shot was dragged wide. Fernando Torres worked tirelessly all afternoon and was replaced by Mikel late on. This was typical Mourinho. I approved. Rather than settling for a 2-1 victory, however, we continued to push forward. On eighty-nine minutes, we witnessed great perseverance from Ramires as he fended-off tackles from three opponents, retained possession and, with a wicked turn, whipped in a lovely ball for Ba to prod in. At the final whistle, the poor first-half was virtually forgotten as we slowly made our exit out. “Blue is the Colour” was being played, John Terry and Frank Lampard were applauding the Chelsea faithful for our support and everything was well the world. On the walk back to the car, PD and I quickly reviewed the race at the top of the table. Oh no, wait – I have an idea. Swindon Town vs. Chelsea : 24 September 2013. Chelsea’s Capital One Cup game at Swindon Town’s County Ground was always going to be a special one for me. It would be our first competitive match at Swindon for almost twenty years but, more importantly, it also represented the nearest that I would get to a “home” game – of sorts – during this season and, probably, for many a season to come. From my place of work in Chippenham, right on the A4 – on the path of the old Roman road which linked Bristol and London – to the County Ground in Swindon is a journey of just over twenty miles. After countless midweek jaunts up the M4 to London, this was almost too good to be true. The county of Wiltshire is not known for its footballing heritage. For many years, though, it was 1-0 up over my home shire of Somerset. Swindon Town’s presence in the Football League ensured that the rural county of stone circles and chalk horses stayed ahead in the local football bragging rights. Only since the emergence of Yeovil Town in the past decade has Somerset equalised; both counties now have a Football League team. Maybe my home county wins though; it has a county cricket team, while Wiltshire doesn’t. I have lived my entire life in Somerset – save for my college years and the three years of wanderlust which followed – but I have always worked over the border in Wiltshire; my twenty-three years of employment has taken place in the small towns of Westbury, Trowbridge and Chippenham. During my childhood in Frome the local teams, supported by a few school friends, were always the City and Rovers of Bristol; Swindon Town was definitely off the radar. Since working in Wiltshire though, I’ve encountered more followers of Swindon. It must be a county thing. As soon as the draw was made, it was obvious that this match would entice many of my local Chelsea friends to attend. A hefty “gathering of the clans” from my surrounding home area was guaranteed. However, the game at Swindon turned out to be an extra-special “local” game for one friend in particular, even although her home is on another continent. The plans for the game at Swindon came together over a few days. I nabbed my ticket at the earliest opportunity. After a few days of waiting, Parky thankfully acquired his ticket too. We made tentative plans to meet up with Mark from Westbury at the Red Lion pub in the midst of the historic stone circles of Avebury on the way to the game. There was quite a local “buzz” about the game. A few Swindon fans from work had tickets; it would be their biggest home game for years. Then, out of leftfield – or at least outside the penalty box – came a bolt from the royal blue. My friend Karen, from Connecticut, contacted me and explained that she would be in Swindon, of all places, on a work visit on the day of the Chelsea game. Talk about serendipity. Although I promised to try to attain a ticket for her, I wasn’t sure any remained. At the very least, we could meet up for a pint. I had first met Karen, surreally, on a yellow school bus, which was used to ferry bevvied-up Chelsea fans from a pub in central Philadelphia to nearby Chester for the MLS All-Star in the summer of 2012. We had chatted about Chelsea in between swigging warm beer and singing a few old favourites. I had briefly bumped into Karen at Yankee Stadium last May, too. Miraculously, the very next morning more tickets went on sale. I was able to get hold of one. Karen was a lucky girl. Ticket requests from a few friends continued, but I had given up hope of getting hold of any extras. However – quite fortuitously – at the Fulham game on the Saturday, two more tickets became available; one for Les from Melksham, one for Glenn from Frome. Things were falling into place. This was going to be a great night of football. Then, the good luck continued. Bristol Tim informed me that he had heard that the Chelsea team were staying at the very same hotel, just off the M4, that – yes, you’ve guessed it – Karen was staying in. I was actually surprised that the team would be staying in a hotel, just 80 miles from London, on the night before a League Cup game. It made me stop and think how professional this game of football now is. Rather than travel down on the afternoon, Chelsea had obviously thought that it was important to get a base in Swindon to fully prepare for the match. I had visions of team meetings, reminders of tactical plans, videos of the opponents and exercises in the hotel gym, but also of monotonous hours spent in anonymous hotel rooms, games on lap-tops, idle banter and possible boredom. On the day of the game, I thankfully managed to wriggle away from work at a good time. I collected Glenn and Parky and, with chatter between the three of us making the twenty minutes seem like twenty seconds, soon found myself pulling into the Swindon Hilton (yeah, that just sounds funny doesn’t it?) bang on time at 5.45pm. Lo and behold, I soon spotted that the sleek black Chelsea coach was parked right outside the entrance. I screeched into the car park and we hopped out, with my trusty camera in hand. Gary Staker and Eva Carneiro were standing next to the coach, but it was soon evident that the players were yet to emerge. I soon spotted Karen, full of smiles, and we both agreed that this was “perfect timing.” Within just a few seconds, the blue track suited players appeared. I took a few photos. There was a small group of well-wishers nearby, but most players walked straight on to the coach. Kudos to Juan Mata and David Luiz, plus one or two more, for stopping by to sign autographs. Jose Mourinho was close by and so I gathered my nerve and approached him. As I held out my hand, I wished him “good luck for tonight” but for a horrible moment I was sure that he would blank me. He looked as miserable as sin – I felt like saying “come on mate, Swindon can’t be that bad” – but thankfully he shook my hand, albeit rather dismissively. Glenn wished him well, too. Karen, I think, was near to fainting. As we walked back to the car, I wondered why Parky was nowhere to be seen. The answer? In my haste to rush off to see Karen and the players, I had unfortunately locked him inside the car. Karen was bubbling as I drove into the town centre. During the afternoon, she had found herself alongside Doctor Eva on the running machines in the gym; they had exchanged words and, once Eva found out that Karen was a CFC supporter, had offered her a ticket. We decided to have a couple of drinks at the adjacent cricket ground, which adjoins the football ground to the north. The rather antiquated, but still ornate, white pavilion housed a small bar and we soon ordered a round of lager and cider. Within seconds, the queue at the bar was formidable; again, we had arrived just at the right time. Outside, there was chat with a few friends as we made our way out into the gorgeous evening as the sun slowly faded to our right. Karen was enjoying the cider as I explained a few things about football in England and how it differs in so many ways from the US sport scene; there’s a book there, or maybe an encyclopaedia, waiting to be written. We chatted with Big John, who sits just a few seats away from us at HQ, about all things Chelsea. Karen was amazed at our collective weight of support for the club and team. Karen asked John if he went to all the games. Karen yelped “a couple?!? !”” as if it was beyond belief that someone could be so devoted. I smiled. Karen was in good company. This would be Karen’s fifth Chelsea game. Her first one was Juan Mata’s debut at home to Norwich in 2011. After numerous visits to Swindon with work, Karen was still pinching herself that Chelsea were in town and she had a ticket. The night fell and we made our way to the ground. I told Karen to be sure that the next time a rogue Manchester United supporter back in the US confronted her about being a glory hunter, Karen should be sure to respond with the two key words “Swindon away.” Glenn and Parky made their way to the open Stratton Bank – where I stood with a Newcastle United mate in 1993 as Andy Cole made his Geordie debut – while Karen and I lined up for the seats in the main stand. We bumped into a few lads from Trowbridge and I think Karen was slightly surprised how many people I knew. The ground hadn’t changed one iota since 1996. To my left, the Stratton Bank, proper old school, open to the elements. To my right, the small covered Town End. Opposite, the single tiered Don Rogers Stand, which had replaced the idiosyncratic Shrivenham Road Stand in the early ‘nineties. The Shrivenham Road Stand consisted of a small terrace underneath a single tier of seats which had originally been part of the parade ground where the Aldershot Miliary Tattoo took place. It was so antiquated and flimsy that it seemed that a gust of wind would tear it asunder. That it survived so long is a miracle. It took me back to 1988. On a cold midweek evening in January of that year, we played Swindon Town in the Simod Cup. My father had battled hard against the evening traffic and then found parking almost impossible. He dropped me off and I rushed to the away section, right underneath the upper tier of the old stand. I arrived about five minutes late and, by then, Chelsea were already 2-0 down. My parents were hoping to get tickets for the main stand. Our turn out was about 1,200; not bad for a midweek game in a ludicrously unimportant match. My mate Leggo had informed me – as was the way in those days – that a mob of Swindon had charged some Chelsea chaps back at the train station. At the time, Swindon were a Second Division team. We eventually lost 4-0. I remember gallows humour throughout, but also chants of “Hollins Must Go” too. At the end of the game, with dogs barking outside and the police trying to ensure that the locals had been dispersed, we were kept inside for around ten minutes. I looked down to my left and there, to my disbelief, were my parents. I had to rub my eyes. My parents – my Dad in his work suit and a sheepskin coat I am sure – in amongst the hoodlums of the Chelsea away pen. I sauntered down to see them. I was in shock. Evidently, all seat tickets had been sold – the gate was 12,317 – but my parents were allowed entry into the home turnstiles at half-time for a half-price £2, and were then escorted around the pitch by stewards and taken to the away pen. Even now, that makes me laugh. 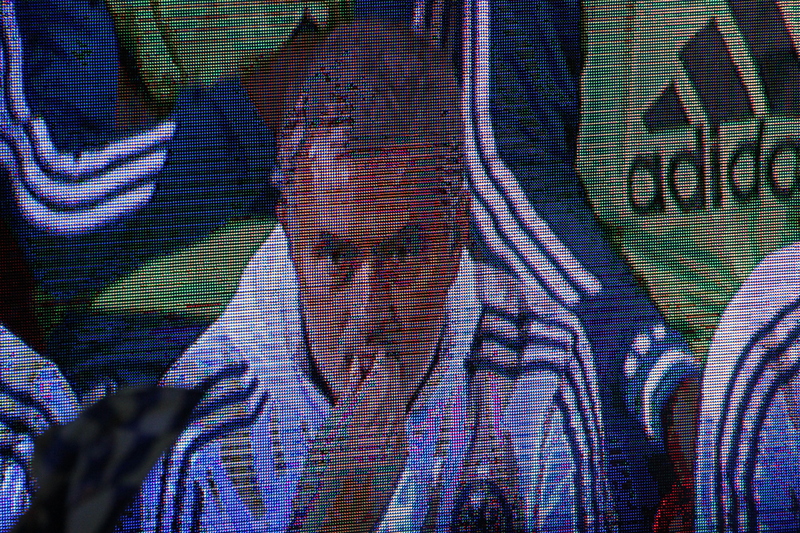 As the teams entered the pitch, the TV cameras picked out Mourinho on the bench. His image was shown on the large screen to my left. He was looking pensive and still quite miserable. In addition to around 2,000 fans on the Stratton Bank, Chelsea had around 1,400 in the corner section of the main stand; I was stood right next to the docile home fans, right next to a line of police, though there would be no trouble tonight surely? My mate Simon – from 1984 – came down to sit next to me and I soon retold the story of my parents being led around the pitch in 1988. If only I had my camera with me then. It was lovely to see Michael Essien back; he did well throughout. Elsewhere, there were mixed performances. I thought that Willian had a very quiet first-half and did not try anything adventurous. The van Ginkel injury – not far from where I was stood – looked serious and it was with sadness that he was replaced so soon. Ramires entered the fray and his energy gave us a little more vibrancy. A David Luiz free-kick whizzed through the air and the Swindon ‘keeper Foderingham did well to save. The away fans sang about Dennis Wise and the San Siro and I soon realised that our former captain – and for a short period, Swindon manager – was in the Sky TV studio in the far corner, just where I had stood in 1988. He waved at the Chelsea fans and they roared again. There were pockets of away fans singing, but nothing worth noting. Swindon is inundated with roundabouts. I’ll get back to you all on the inbreeding. Fernando Torres was clean through after a Juan Mata touch, but the Swindon goalie flung up an arm and batted his effort away. Right after, Ramires set up Mata whose effort was parried only for Torres to touch in at an acute angle. He celebrated quietly in front of the home fans who had just recently taunted him. Quickly, a second goal, with a sublime ball from Torres allowing Ramires to deftly chip over the ‘keeper. Swindon, with the diminutive Pritchard at the heart of their attacks, offered a few efforts on goal, but Mark Schwarzer was largely untroubled. John Terry replaced Rami at the break. Our captain was actually applauded by the home fans as he entered the pitch; this made a refreshing change. I guess that the locals were just happy to see a famous player on their home turf. A Swindon goal was disallowed for offside. De Bruyne, clean through, was unable to finish. Swindon perhaps should have scored after a great cross caught us flat-footed at the back. Torres looked as though he was keen to impress and showed neat footwork on a number of occasions, but his finishing was lacking. Next, a wasted Willian chance. Demba Ba, who replaced De Bruyne, then curled a shot narrowly wide. Lastly, another strong Torres run ended up with over-elaboration and frustration when Willian stabbed at the ball instead of allowing Nando to finish. On another night, we could have scored five. The four of us reconvened back at the cricket pavilion. Karen had met a few more Chelsea fans during the night and it was clear that she was integrating herself well into the Chelsea Family. We all agreed that it had been a so-so game of football, but everything else had been perfect. There was time for one last drink back at the Swindon Hilton (admit it, it still sounds odd) and time for reflections on the past few hours. Oh, and time for some typically crap jokes from Lord Parky.